Orders payable to Anola School Playground. Due to the office by April 17. Pick up date: Friday May 24 at Anola Community Club 3:30-7:00. 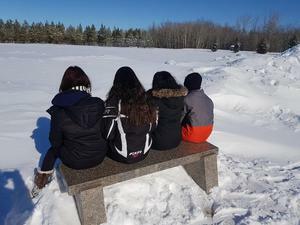 Take Pride Winnipeg recently presented Anola School with an outdoor bench made from 100% recycled materials. Monday January 28, 2019 9:00-7:00. January 29 to February 1, 2019 9:00-3:00. Proof of Age must be presented at time of Registration, a Birth Certificate would be preferred. The ABPA is requesting donations for our annual bake sale on December 4th.